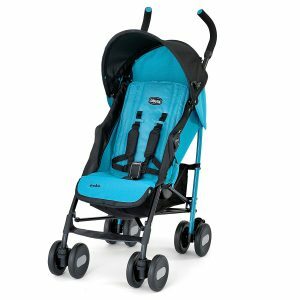 Valco has been producing baby products in Australia for over 20 years and has recently started selling their baby strollers in the USA. This is a rugged stroller with large wheels that works well in the city but is more comfortable outdoors and on rough terrain. The large 12″ wheels will handle just about any sort of rough terrain that you are ever likely to want to take a stroller on. It is very easy to push and steer this stroller with one hand and when the front wheel is free to swivel, it will turn on the spot. It is narrow enough to be practicable in shopping isles and even with the Toddler seat attached, the width is not affected. Folding is not difficult but you do need both hands and a foot. This is my biggest gripe about the Tri-Mode stroller. If you are in a rush, you still have to put your baby somewhere secure before you fold the stroller. Weighing in at 23 lbs, this is not a light stroller and if you have to lift it a lot, you may want to consider a lighter stroller. The seat can recline fully flat or be positioned fully upright and can be adjusted to any angle in between. If the seat is empty, it is easy to adjust with one hand using a strap at the rear but if your baby is in the seat, it is a little more difficult to adjust and you will probably need to use both hands. The seat is suitable for newborns when the infant safety flap is attached. When this is removed, the seat is suitable for older children. The seat has a 5-point safety harness with a childproof lock mechanism. Car seat adapters are available to convert the stroller into a complete Travel System. 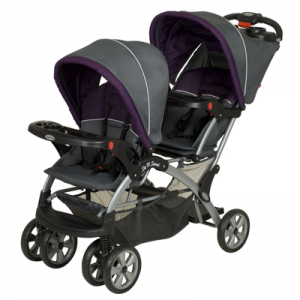 When buying your first stroller, you will never buy a double stroller unless you know that you are having twins. The Valco Baby Tri Mode stroller can be fitted with a Toddler seat to easily convert it into a double stroller. This means that the stroller can grow as your family grows. 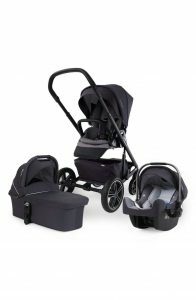 With the Toddler Seat attached, the stroller becomes an in-line, double stroller and therefore the width remains the same. The Toddler Seat is easily removed and can be temporarily stored in the storage basket. You should be aware that you cannot use the Toddler Seat and the car seat adapter at the same time as these accessories both use the same attachment points. A bassinet is available for newborns but we did not have one available for this review. The canopy is large and functional and will protect your baby from sunshine from most angles. It attaches with a zipper which is easy to use. The canopy also has a mesh viewing window with a velcro fastener and this also helps with ventilation to the seat in hot climates. It also has a mini-visor for even more protection from sunshine or rain. 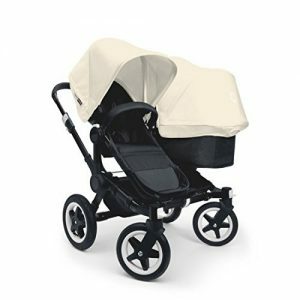 Reflective piping around the edges makes the stroller much safer to use at night time and stroller visibility is greatly increased. 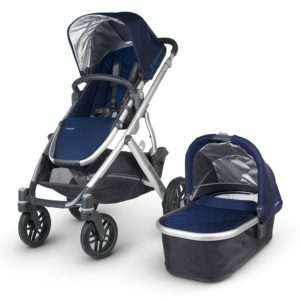 Unlike many other strollers, the Tri-Mode single stroller comes with a plastic rain cover. The basket is located underneath the seat. Unfortunately, this is not a good design. It is fairly large but it is not easy to access. I was just about able to fit my diaper bag into it but it was a very tight fit due to the seat above. There are other, small storage pockets on the side and a detachable, zippered bag on the canopy. When this bag is removed, there is a large, mesh viewing window available to use on the back of the canopy. This canopy bag can be handy to take separately from the stroller when you are going shopping. The smaller pocket at the rear of the seat is useful for storing smaller items such as keys, toys etc. The other small pocket at the base of the seat is where the tire pump is stored. The handlebar is very easy to adjust and will accommodate both tall and short parents. I am 5′ 11″ and I had no difficulty finding a comfortable height to push. My sister in law is only 5′ 3″ and she too had no problem finding a comfortable height for the handlebar. The brakes are foot operated. The brakes are easy to use and lock both wheels simultaneously. The Valco Baby Tri-Mode Single Stroller is a jogging stroller that is just as much at home in the city as it is in the country. 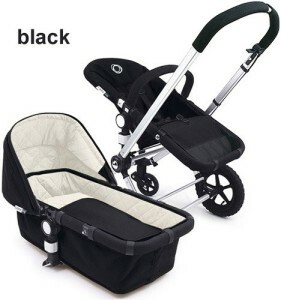 Its large wheels provide superb comfort for any baby and the three adjustments available on the front wheel provide for the perfect amount of maneuverability depending on whether you are jogging, shopping or going over rough terrain. We liked the way the stroller could be expanded to carry a Toddler Seat and converted into an in-line Double Stroller and also that it easily converts into a Travel System with the addition of a car seat. This stroller is well designed, sturdy and very, very practical. These strollers have a good resale value. We did not like the difficult to access storage area and the fold was not as easy as it should be. Folding will not be an issue unless you intend to use a lot of taxis or you are going to be putting it in your car frequently. We also did not like the fact that we could not remove the fabric for washing. However, this stroller was made for walking – or jogging and we think both you and your baby will love it.